The mission of The Education Policy and Leadership Center (EPLC), a 501(c)(3) organization based in Harrisburg, Pennsylvania, is to encourage and support the development and implementation of effective state-level policies to improve student learning in grades PK-12, increase the effective operation of schools, and enhance educational opportunities for citizens of all ages. In keeping with this mission, EPLC has increasingly directed attention to the need to promote an educated citizenry. All arts experiences provide opportunities for learning and that access to the arts in its many forms is essential to nurturing an educated citizenry in Pennsylvania. PK-12 arts education programs and arts experiences for all youth are essential for their intrinsic value and because they support the broader educational goals of the Commonwealth. Effective public policies can enhance access to the arts for all citizens, assure valuable arts educational experiences for all youth, and raise public awareness of the social and economic value of the arts in communities. 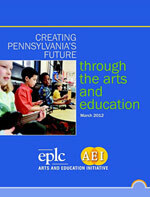 In March 2012, EPLC released a report, Creating Pennsylvania’s Future Through the Arts and Education, which includes a set of recommendations for policymakers and other audiences. The report is intended to help build in Pennsylvania more awareness and support for the arts and arts education among policymakers, community leaders, and the general public. The process leading to the Report included discussions by a 32-member Study Group, eight community forums, a Pennsylvania state policy inventory, an online discussion, surveys of several stakeholder groups, and a day-long Symposium in October 2011. Since its release, the Report has been widely distributed in Pennsylvania and is helping to stimulate and inform discussions about the arts and arts education. Special presentations are being made to state policy leaders and EPLC continues to host regional community forums to promote discussion about the Report and its findings and recommendations. A 3rd Annual Arts and Education Symposium was held on October 30, 2013 at the State Museum of Pennsylvania in Harrisburg, and many statewide and local arts and education organizations are incorporating discussion about the Report into their respective conferences and special events. Stemming from a recommendation included in the Report, EPLC created the Pennsylvania Arts Education Network to help to support the Report’s recommendations. The Network is a statewide coalition of arts, arts education, and advocacy organizations and individuals committed to working together to strengthen public and policymaker support for Arts Education in Pennsylvania. Directed by a Steering Committee of influential arts and education organizations across the state, the Pennsylvania Arts Education Network is currently being operated through EPLC. The Arts and Education Initiative of EPLC is currently funded with a generous grant from The Heinz Endowments. If you would like to make a contribution to support the AEI and Pennsylvania Arts Education Network, please click here. For more information about the Arts Education Initiative or the Pennsylvania Arts Education Network, please email Ron Cowell at cowell@eplc.org. To receive the Note — EPLC and the Network’s arts and education newsletter — please email Laura Abbott at abbott@eplc.org.